​1. (Harvard Dataverse) ﻿Replication data﻿ for: "﻿Why So Many Layers? China's 'State-Speak' and its Classification of Partnerships﻿"
Description: The emphasis here is on examining whom states are interacting with (actors), not what they are adhering to (objects). Hence, the purpose of the dataset is to be able to visualize the existing collective habitude of what 'state-speak' looks like in the 18 countries of East/Southeast Asia (as of 2015). 'State-speak' is basically the diverse vocabulary or 'labels' that states give to designate their bilateral relationships (i.e. strategic partnerships, comprehensive partnerships, comprehensive strategic partnerships...). Figure 1 represents a force-directed layout with node and lable proportionality based on the number of degrees (how many neighbors a node have and eigenvector centrality (how many neighbors a node have in addition to how well-connected those neighbors are in the network. Description: I have collected data on the diplomatic practice of summonses and summits to extract observations about both conflictual and cooperative sides to inter-state interaction in Northeast and Southeast Asia from 2000 to 2016. 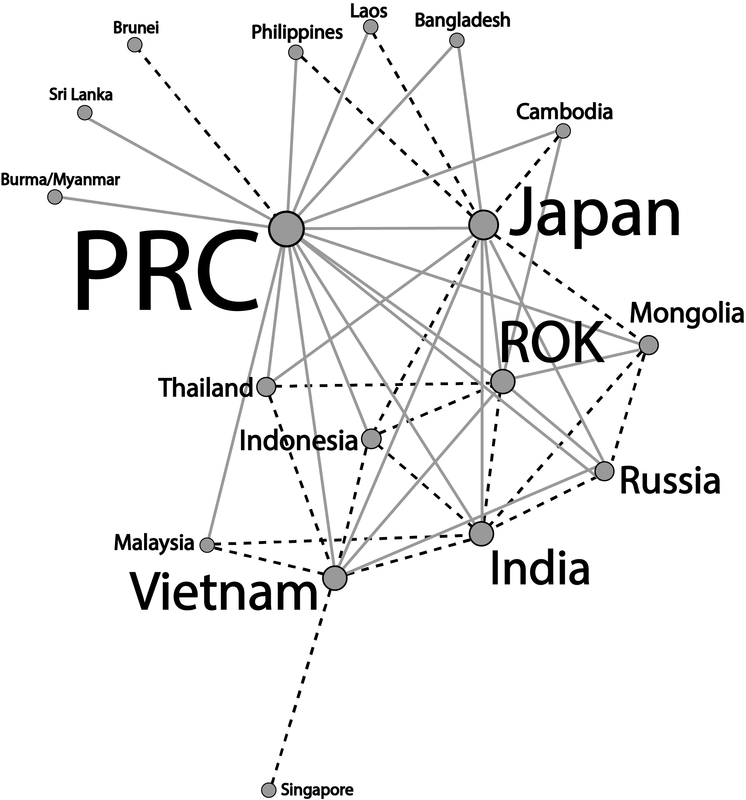 There are several points of interest that the figures convey- perhaps the most immediate one being that the Japan-PRC and the Japan-ROK dyad is conspicuously more conflictual than the PRC-ROK one (which tracks with both scholarly and policy discourse). Another is that the frequency of total summitry at the foreign policy level in Northeast Asia has decreased over the past several years, especially in light of Southeast Asia. *Note for figures 1.1-1.3.: the legend captures the directionality of the summonses so that the source (or summoning) country is represented by the first country that is listed in the pair, with the target (or summoned) country, listed as the second, as well as the accumulative dyadic total represented by the dash line. Description: I have collated information for all elected South Korean female parliamentarians from the 14th (1992) to the 20th (2016) legislative elections based on the following characteristics- age, birth place, alma mater, ideology, method elected, number of times elected, number of bills sponsored, and total assets. (A screenshot of the information is displayed on the left.) The corresponding analysis involved both a poisson regression model and network analysis, both of which are currently being fleshed out in an article. Rather than inspecting gender equality with males as the point of reference, the focus here is on disaggregating female parliamentarians into 'power elites' versus the rest to theorize on the implications of such gap.